Domestic lumber demand is flat. The demand from Christchurch is dropping significantly, but there is an increase in the Otago Lakes area driven by building in Queenstown and Wanaka. There has been a cooling in the development of medium to high rise apartments as banks require a high percentage of pre-sales before lending, but buyers don’t want to place deposits if the build isn’t confirmed. The rest of New Zealand is flat with some mills reporting their sales into the areas of Hamilton and Tauranga down on last year. These areas are still growing but the rate of growth has slowed. Most mills are concerned about log prices with the continued high export log prices against which their prices are often bench marked. This may put upwards pressure on domestic log prices in Q4 as log prices for Q3 are locked in. Domestic pruned lumber demand is flat. The Australian and American markets continue to have strong demand, and most mills report a well-balanced supply of logs. There has been a recent increase in supply as some mills have increased production, with one major supplier looking to re-position themselves in the market. The effect of this increased supply on the market will be interesting, as unless there is new technology or an increase in construction infrastructure, there is limited opportunity for construction expansion. Export lumber prices are flat across all markets. 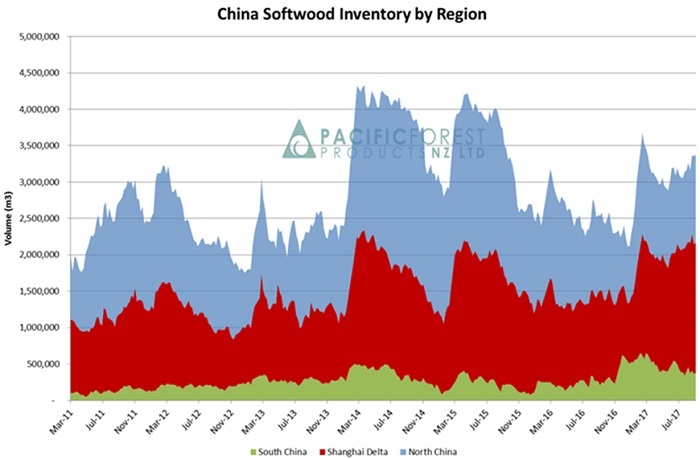 Demand from China continues to be strong, especially in the lower-grade lumber of lower-value. There are mixed economic messages from Australia and stats for housing starts are down, but demand remains steady. Some mills have sold product occasionally to the Middle East, but currently these lumber buyers are struggling to arrange a line of credit with acceptable terms to the NZ mills. 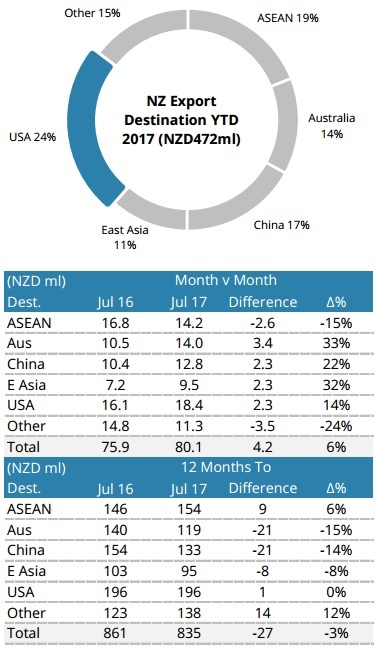 The graph below shows volumes from NZ, PNW and Australia all running at or close to record levels and NZ levels are now higher than the last peak volume period in 2014. 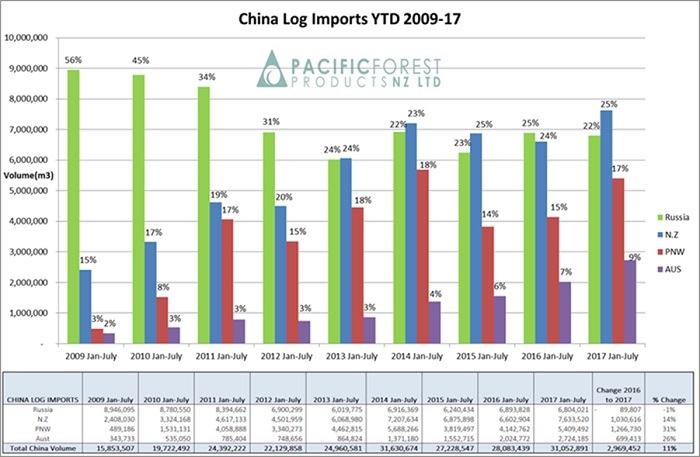 Both log and lumber imports into China continue to grow due to reduced domestic harvest volumes concomitant with economic growth demands. These volumes are depicted in the graphs below. 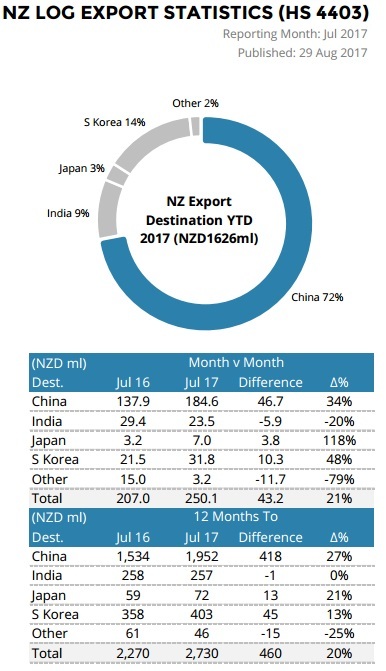 As you can see graphed below many New Zealand ports experienced record or near record levels of export logs in Q2 2017. Many report increased Q3 levels as well. You can subscribe to Champion Freight reports in the following link. They provide reports on exports of both logs and lumber. The market remains well balanced between supply and demand. The stock levels across China have levelled out at 3.3M m3. The demand is still very strong across all log grades, with a healthy daily offtake of 60-65K m3/day. The inventory by region is shown below. While demand and price are steady, there is likely to be more supply as NZ heads out of winter. This may temper the AWG price increases we often see over the NZ summer. Some recent volume that has been diverted to India will likely revert to China, as India inventory is high with recent monsoon and high supply. More volume has been shipped to India than expected. Exporters however, are expecting demand to increase as monsoon season finishes in September, and the activity of the log buyers rebound from the GST introduction mentioned in recent Wood Matters. The ocean freight price has increased slightly. There was a tightening of available freight capacity as ships around Hong Kong lost up to 10 days due to recent typhoons. Bunkers are up $10 and the Baltic Index is surging. Industry commentators now suggest indications are for increasing freight rates in Q4. Lighter logs will be required to improve the stowage rates to off-set these increases. There is no sight of rain ceasing in the CNI though! The exchange rate continues to have the biggest impact on AWG prices for logs. The NZD relative to the USD has continued to drop from the high of 0.75 in July. The NZD traditionally dips in the build up to the election, and then rallies once a government has been established. Prior to the election there will be a Reserve Bank OCR announcement, this time by the stand in Governor Grant Spencer. The US Fed also meet prior to the NZ election but like the RBNZ announcement, markets are expecting very little change. The PF Olsen Log Price Index for September has increased $2 from the August index figure and is now back at the $125 mark. The index is now $6 higher than the two-year average, $12 above the three-year average and $16 higher than the five-year average.